We posted a MacBook Special Report yesterday. In today's 'Book Review we look at MacBook Pro heat, the longevity of the G3 iBook, glossy vs. matte displays, the solid PowerBook 1400, and an iBook that somehow started a fire. On the news front, Toshiba has announced a 200 GB notebook hard drive. Two. Hundred. Gigabytes. If only it spun faster than 4,200 rpm. Which Screen to Choose: Glossy or Matte? PowerBook 1400: The Volvo of Laptops? "At Apple's annual shareholder meeting in April, Steve Jobs waxed lyrical about the MacBook Pro, a laptop powered by an Intel Core Duo chip. 'Everyone wants a MacBook Pro because they are so bitchin',' he said. There is certainly no doubt the laptop is one smokin' hot machine. Literally. "Apple also came under fire for not acknowledging the heat-related problem promptly and publicly, along with other complaints that the notebook also makes an irritating whining sound. When a user took his machine apart, and posted an explanation and a link to the MacBook Pro service manual on the Something Awful forums (forums.somethingawful.com) in an effort to help others fix their heat issues, Apple served the webmaster of Something Awful with a cease and desist order, demanding that the link to the service manual be removed on grounds of copyright infringement. 'Apple reserves its right to contact your [Something Awful] Internet Service Provider in the event you do not comply with these demands,' said the letter, which the webmaster has posted on the site." "This is a Motor Trend-type long term review of my iBook, now four years old and still chugging along well. Cars should have this kind of endurance. "Well, you know me. I have always wanted the perfect writer's computer. One with a minimal keyboard with 55 full sized keys on a nine inch base, with a comparable wide screen above it, and little else, including any drives. And two pounds, maximum. "But, there still isn't any such device, and it looks like Apple is not going to make one any time in the foreseeable future. "What is wrong with this iBook? "Well, Arkowi (and all the others amongst you wrestling with this decision), having both a matte-finish MacBook Pro and a glossy-screened MacBook in the house, I can sum up my observations of the glossy screen in one short sentence: It ain't too shabby." Link: Which Screen to Choose: Glossy or Matte? "I tend to use laptops for my writing work, because they allow me a certain freedom of movement. Since I am a big fan of both Apple PowerBooks and vintage computing technology in general, I usually have a few old Macintosh machines around the house. "A few months ago, I purchased a PowerBook 1400 off eBay for a very reasonable $60. The little 1400 has somewhat of a cult status among PowerBook lovers, being one of the most solid and reliable machines ever to come out of Cupertino. They also have one of the best keyboards ever put on a portable computer . . . not quite up to the standard of the IBM Model M desktop keyboard, but far better than anything put on any laptop made after 1998 or so. When you type a lot, your choice of keyboard becomes a deciding factor when it comes to hardware decisions, so it's no surprise to me that the PB 1400 is a sought-after machine among writers." Link: The Volvo of Laptops? "We hear about the occasional battery recall, and there are always the complaints that computers are getting too hot, but things went to a whole new level for a family in Minnesota. As WCCO in the Twin Cities reports, an 11 year-old boy set a running iBook down on the carpet and left the room. 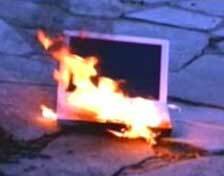 His mother states that they heard a popping noise, saw that the iBook had started melting the carpet and the room was filling with smoke. They quickly carried the iBook outside and remembered to bring their camera along for the show as the iBook, you can see, literally caught fire (WCCO has a video and more images)." "As you can probably guess I use my MacBook Pro all the time. It's my primary machine and blogging for ZD Net, editing the PowerPage, email and IM keep me pretty busy. A couple of weeks back my MBP keyboard started acting a little wonky. "I use the MacBook Pro's built-in keyboard about 75 percent of the time (the other 25 percent of the time I use an Apple Bluetooth keyboard) and about three weeks ago the space bar started sticking. It wouldn't stick entirely, but instead would come up very slowly after being pressed. While not a problem initially, it started coming up slower and slower and often wouldn't return to the 'unpressed' position by the time I needed to use it again resulting in a lot of sentences withoutspacesinthem." PR: Toshiba Storage Device Division (SDD), the industry pioneer in small form factor hard disk drives (HDDs), has introduced a 200 GB 2.5" HDD based on advanced Perpendicular Magnetic Recording (PMR) technology. Toshiba's second-generation PMR offering features the world's highest areal density at 178.8 gigabits per square inch and the highest capacity in the standard 9.5mm mobile PC format. The 200 GB dual-platter MK2035GSS is Toshiba's first PMR drive to incorporate tunnel magnetoresistive recording (TMR) head technology. Toshiba's new 2.5" HDD is light weight at 98 grams and incorporates the Serial ATA (SATA) II interface with native command queuing, enabling faster data transfer rates and improved technical performance. "As a leading partner for mobile PC manufacturers, we've listened to our customers' needs for high-capacity storage in a small form factor to enable the advanced multimedia applications and enriched usage experience that consumers are demanding today," said Scott Maccabe, vice president and general manager, Toshiba SDD. "Our technology innovation in PMR has laid the foundation for delivering the industry's highest capacity and areal density in the standard mobile drive form factor. It's a win-win combination for mobile PC manufacturers who want to differentiate their offerings with features that attract high-end consumers." Using Toshiba's 200 GB 2.5" HDD, mobile PC manufacturers can create value with end consumers by providing enough capacity for gaming, video, music and other multimedia applications, positioning these mobile PCs as viable desktop replacement options. Toshiba is the industry leader in mobile HDD shipments (2.5 inch or smaller form factors) with a 29 percent market share, according to research firm IDC. The company has held that position since Q3 of 2005. Toshiba will start mass production for the 2.5" 200 GB MK2035GSS HDD in August 2006. The company will showcase the new HDD at Computex in Taipei, Taiwan, June 6-10, 2006, in booth #B624. The procedure for Intel-based 'Books is somewhat different from PPCs. "CNET Labs compared the 17-inch MacBook Pro against a number of older Apple laptops running the PowerPC processor as well as other Core Duo-based Macs. Unsurprisingly, the MacBook Pro trailed behind a PowerBook G4 when running Sorenson Squeeze, which requires the Rosetta translation program to run on the new chipset. But its ample amount of RAM and quick hard drive helped it power through our Photoshop CS test, in spite of Rosetta." "If you edit videos or photographs on the run, this might be an ideal machine. If I wanted an ultracool desktop-replacement notebook that would, 50 weeks of the year, sit on one desk alone, this would be tempting: the 17-inch screen is really, really nice. "Those are exceptional cases, however. Most of us buying Mac notebooks - or any notebooks, for that matter - are looking for computers that are relatively easy to take with us on the road, something we can throw into a bag and run with, if running is required. "For those needs, the 13-inch MacBook (no 'Pro'), recently introduced but not yet reviewed here, might well be an option. For "professional" users who want more graphics power, the 15-inch MacBook Pro should do nicely, and will be easier to tote...."
PR: Fabrix cases add colours to life by harnessing fashionable materials. Each fabrix case is unique as they are individually handmade and hence you wouldn't be able to find an exact duplicate anywhere in the world. Each fabrix case is sewn to precision to fit the specific dimensions of each intended device, unlike mass-produced cases which come in generalised sizings, fabrix cases are constructed to fit specifically for your device, meaning no more of your devices swimming in excessively large cases. Would you rather own a "one-of-the-many-made" or a "specially-made-for-you" case ? Each fabrix case is individually handcraft to fit the specific dimensions of each intended device. The interior is lined with inner paddings to offer optimum protection for your precious devices, especially against light bumps and knocks. Different designs might varies slightly in overall level of protection and thickness, depending on the material used in the design. Certain materials are slightly tougher by nature and hence will be able to offer a higher level of protection for your devices. Fabrix cases are generally water-resistant but not waterproof. We have already factored in such considerations prior to our materials selection process and each material that we use are fairly water resistant. 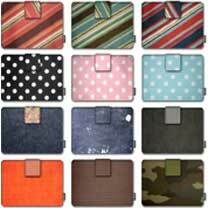 Fabrix cases are fully constructed using fabrics, just like the clothes we wear. Hence, they are washable. However, frequent washing might cause the fitting and shape of the case to change overtime. It is recommended that fabrix cases be washed with very mild soap, using lukewarm water and dried naturally so as to retain its original form. After washing and drying, place the fabrix case on a flat surface and put a piece of paper on top of it before ironing gently. That should get your fabrix case back into shape. Cushioned with high-grade internal quilted paddings that provides your laptops the optimum level of protection against scratches, light bumps and knocks, yet not compromising on the size and form factor. Hand sewn to precise dimensions to fit each laptop perfectly unlike mass produced laptop cases which comes in generic sizings. Available in Horizontal or Vertical Loading orientations. Add-on handles are available as well (Additional charges apply). PR: Kensington has announced the introduction of 20 new products for the mobile consumer just in time for Dads, Grads and Back to School consumer buying season. The new products include four additions to Kensington's market leading MicroSaver line of notebook locks, the most expansive launch of notebook cases in Kensington's history, and new mice, presenters and a video capable universal notebook dock. According to analysts, notebook PCs are expected to grow 30% in 2006 with sales reaching 70 million units worldwide. This growth is an indication that notebook computers have now become for many an essential productivity tool, whether for work or personal use. According to a recent survey commissioned by Kensington, nearly 70% of men and nearly 60% of women surveyed said that they were either very likely or somewhat likely to take their notebook computer with them on vacation. "We're delighted to be announcing a wide range of products that help our customers better enjoy their mobile lifestyles," said Rob Humphrey, Director of Marketing, Kensington. "Notebook computers have become indispensable to our lives, and the new Kensington products make their notebook experience more enjoyable, productive and secure." Through recent high profile media reports many consumers have become increasingly aware of the susceptibility of their notebook PCs to theft. What many don't know is that every brand name notebook PC has a built-in Kensington security slot to enable theft deterrence and prevention. Long the leader in physical notebook security, Kensington is introducing four new MicroSaver locks with improved locking mechanisms, stronger steel cables, superior design and enhanced styling. The new locks resist lock tampering and theft attempt. The complete line of Kensington notebook locks include both keyed and combination solutions, and are available now at suggested retail prices (SRP) of $39.99 to $69.99. Kensington's consumer survey also showed that Style and Comfort were the most important criteria for selecting computer carrying cases. Roughly 40% of men and women viewed Style and Comfort each as the most important purchasing criteria. Kensington is introducing nine new Contour cases that are exclusively endorsed by the American Chiropractic Association (ACA). Combining a proprietary contoured panel and intelligent weight distribution system, these cases shift their weight to the user's stronger, load-bearing muscles, effectively lightening the load and reducing muscle fatigue by up to thirty-five percent (35%). 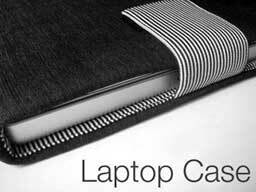 (1) Designed to accommodate the growing number of notebook users, the cases target four distinct market segments - the frequent business traveler, the daily commuter, the urban gadget lover, and the light traveler. These cases are available June 15 and range in SRP from $29.99 to $99.99. Expanding its notebook dock line, Kensington is introducing the Notebook Expansion Dock with Video, which uses powerful port replication technology to utilize a single USB port to connect your notebook to USB peripherals, speakers, keyboards and mice, and even runs 17" and 19" desktop monitors at native display resolutions with high-fidelity image quality. A unique wedge design lifts the notebook and increasing airflow to aid cooling. This product is available now at $179.99 SRP. The Ci60 Wireless Optical Mouse offers wireless convenience while combining the comfort of soft rubberized grips and innovative right-handed design with the precision and accuracy of DiamondEye optical technology. With five programmable buttons that can be customized to streamline important tasks such as launching applications or navigating Web sites, these mice are the perfect combination of comfort, control, and convenience. The Ci20 Optical Mouse combines the comfort of soft rubberized grips and innovative right-handed design with the precision and accuracy of DiamondEye optical technology. With five programmable buttons that can be customized to streamline important tasks such as launching applications or navigating Web sites, these mice are the perfect combination of comfort, control, and convenience. Kensington looks to extend its market leading position in wireless presenters with the introduction of two new products, the Wireless Presenter with Laser Pointer and the Wireless Presenter. These presenters empower users to control their presentation anywhere in the room - up to 50 feet away. They are conveniently portable and easy-to-use, with 2.4 GHz wireless technology for secure and reliable performance along with smart power management. Additionally, the wireless USB receiver stores inside the palm-sized controller for carrying convenience and acts as the on/off switch. The wireless presenters are designed to fit comfortably in the palm of your hand. Expanding its iPod accessory line, Kensington is introducing the 4-in 1-Car Charger for iPod. Driving and your iPod naturally go together. Keep the sound moving with the Kensington 4-in-1 Car Charger for iPod that powers click wheel iPods, including iPod nano and iPod with video. A pass-through connector keeps FM Transmitters on, even while charging your iPod or other USB devices. Kensington products are available at a variety of nationwide retail and online stores including Circuit City, CompUSA, OfficeMax, Staples, Apple Stores, Fry's Electronics, Micro Center, CDW, Dell, Amazon.com, Buy.com, and Kensington.com. PR: SideTrack is a replacement driver for Apple PowerBook and iBook trackpads. With SideTrack installed, your standard trackpad becomes a powerful multibutton scrolling mouse. Extended control over the trackpad button and tap gestures. Use trackpad taps for left click, drag gestures, or right click. Complete scroll wheel mouse emulation with customizable scrolling speed. Place your scroll zones on either side of the pad, or both sides simultaneously. Map hardware button to left or right click. Map trackpad taps to no action, left click, left click drag (with or without drag lock), or right click. [BUG] Fix wake from sleep USB reset on 2005 iBook G4 models. PR: iScroll2 is a modified trackpad driver that adds two-finger scrolling capabilities to supported pre-2005 PowerBooks and iBooks on OS X 10.3 and up. Note: Models that have two-finger scrolling already built-in are not supported! These use a completely different, USB-based trackpad, the driver or which is not available as open source. Models that are known not to be supported include all G3 and Titanium PowerBooks, the very first 12" PowerBook model, all G3 iBooks, and all newer machines that come with two-finger-scrolling built-in: The trackpads of the older machines simply lack two-finger detection capabilities completely, whereas the models that have scrolling built-in use a completely different, USB-based trackpad, the driver for which is not available as open source. "eWeek Labs: A sneak peek suggests ultraportables from HP and Lenovo may challenge earlier thin notebook offerings." TechRestore is offering a $25 discount to The 'Book Review readers off any PowerBook or iBook in stock. Just enter the code CWM during checkout when ordering online. The coupon code is valid from now through 12/31/2007.